It's about time for an official introduction to this game. First of all, it's very much inspired by Dyson (which was evidently renamed Eufloria). Dyson is (was?) a slow, relaxing RTS that boiled the genre down to some essential elements. Your troops are your spending resources. You can spend troops to either add static defenses or increase troop production. Certain locations in the game were more valuable than others for production. These are really basic elements that combine into tactically interesting choices. Elegant complexity from simple parts. An ideal of game design! In Aurora, I'm trying to strip down the genre even more. Defensive upgrades are gone. All locations produce troops of the same strength before upgrades. Combat is a simple matter of mutual annihilation. I'm also trying to see if I can make it work without an exploration element, i.e. all enemies in Aurora are visible from the start. It may be impossible to include this and still keep it a game of strategy rather than memorization and mouse dexterity. We'll see. I wanted to recapture the feeling of moving large bodies of troops across the field of battle. In Dyson, your troops moved from point to point in an orderly line. I like seeing my soldiers clashing in a wider battle, or moving out to intercept the enemy. 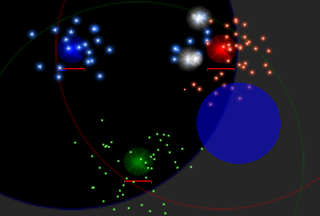 Aurora encloses the battlefield, but your troops can move anywhere within that space. The visual style is far from complete, but I'm trying to use abstract space-imagery. Troop production buildings look like suns. Troops look like tiny stars: points of light floating on a black background. I'd like everything to move smoothly, even gracefully, until the climactic moment of destruction. I'm also trying to add a synchronized-music aspect to the game, where the soundtrack and game actions compromise just enough to sync up in an entertaining way. Hopefully it will make music out of the game's events. Right now I'm adding in the first bits of AI. The game will be playable after that. Hooray alpha! Here's what it looks like right now. No laughing. Just got back from a trip to Spain, Morocco, Ghana, South Africa, Mauritius, India, Vietnam, China, Japan, and Hawaii. It was pretty crazy. I'm also pretty sure it will make me a better game developer, if only because I learned and saw a lot of interesting stuff. I had a lot of time on the ship in between ports and made good progress on Aurora, the stripped-down RTS I wrote about earlier. All the basic systems are complete, except for a decent AI. The code (which was wholly rewritten at one point) is clean and in good shape to expand. At one point I was really worried about performance issues. I think I've got it in a good spot now, though. Each army can have a lot of troops floating around, and it's only when several hundred converge in battle that things get choppy. We'll see if that ever becomes a problem. I'm also seriously planning to spend a weekend revising Azure. The text idea didn't turn out as well as I'd hoped, and the game gets boring pretty quickly. I'm thinking that if I add another handful of patterns of movement for the player to follow, the game might remain as engaging and hypnotizing as I want it to be. The game could switch between them in random order after every minute or so of success. I also really want to get MUTE up to speed... sigh. So much to do!